Nothing screams “Harvest Time!” more than a good old-fashioned grape stomp! September is always a busy time in Temecula Valley Wine Country and our wineries are busy planning a few celebrations of their own. Hosted Tour & Wine Tasting /Available on Sunday of each the month / 2pm-3:30pm / For every adventure, there is discovery, for every unique place, there is a story. Take a guided journey through our lush vineyards and experience our rich heritage and handcrafted Avensole wines / Cost. $35 / Reservations required. Please call 951.252.2003 x312 to reserve. Brunch Specials every Sunday at Meritage / 11am / Cost is $25 / Includes a mimosa with fresh squeezed orange juice, entrée and dessert. All food from Meritage is farm-to-table, either grown on property in restaurant garden or locally outsourced. Labor Day Weekend Celebration / September 1st-3rd / 10am -5pm / Special Weekend Lunch Special for 2 in the Pinnacle $59, Special Wine Sales, Lawn Games, BBQ. Reservations required 951-676-8231 Option 4. Wine Down Wednesday / August 1 / 5pm-7pm / Join us on the Vintner’s Lounge Patio for a tapas evening featuring Chef’s Pantry. Assorted tapas available for purchase $2.00 – $5.00. Wine by the glass and/or bottle available for purchase. Wine club complimentary glasses & tastings are not included. No reservations required. 5th Dimension Concert / September 8 / 6:30pm -10:30pm / Legendary and Multi-Grammy Award Winner 5th Dimension Concert performing their classics Aquarius/Let the Sun Shine In; Wedding Bell Blues; One Less Bell to Answer; (Last Night) Didn’t Get to Sleep at All; Up, Up and Away and many more. This concert will benefit Music Therapy for Veterans. Come join us for a Great Evening on our outdoor patio under the stars. Cost and reservation information: VIP Dinner Package/Tickets available – $105 to $115 General Admission Tickets available – $60-$65. To purchase and reserve tickets – visit www.montedeoro.com, go to “Store & Event Tickets”, then click on “Events” in lower left-hand side. Brunch at Bouquet Restaurant / Every Saturday & Sunday / 7:30am-3:00pm / Offering indoor & outdoor seating options, Bouquet is the perfect spot to gather for a gourmet brunch. Enjoy a relaxing ambiance with stunning fountain courtyard, pond & vineyards views / To view menu and for reservations please visit www.pontevineyardinn.com. 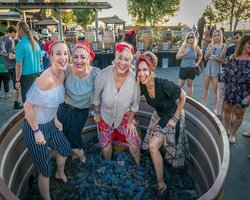 Annual Grape Stomp Event / September 16 / 5:00pm – 8:30pm / Cost: GA $55 | GA w/ Stomp $80 | Wine Club $50 | Wine Club w/ Stomp $75 / Join us for South Coast Winery’s Grape Stomp! Enjoy live music, grape stomping, great food & wine and great company! / Purchase tickets through our Online Store at SouthCoastWinery.com. 21+ event. Wine, Dine & Paint / September 22 / 10:00am -1:00pm / Cost: $75 | $70 Wine Club / Work one-on-one with Jill Roberts, internationally-known, award-winning artist, at one of our all-inclusive Wine, Dine & Paint classes, complete with: A three-hour guided Art+Vino painting class Painting supplies, aprons and canvas, Winemakers lunch at The Vineyard Rose Restaurant with a glass of wine / Purchase tickets through our Online Store at SouthCoastWinery.com or call your Wine Club Concierge at 951.491.8506. Must be 21+ to attend. Weather permitting. Additional wines by the glass or bottle available for purchase. Location subject to change. Due to the limited size of the event, all sales are non-refundable/exchangeable. Behind the Scenes Wine Tours / Tours are held daily at 11 AM, 1 PM and 3PM, Monday through Sunday/ $45pp; $40pp Wine Club Member or Military / Learn more about our spectacular Southern California Temecula winery with a behind-the-scenes wine tour, from vineyards to crush pad. Each tour concludes with 5 wines paired with an individual plate of specially prepared lite-bite foods, designed to enhance your wine knowledge and experience / Reservation Information: Call 866-994-6379 Ext. 7217 to reserve your spot today / Due to the limited sizes of each tour, reservations are required with prepayment, and are non-refundable. Guests must be over 21 years of age to attend. Bubble Brunch Buffet / Every Sunday 10am-3pm / $51.95, Buffet only: $41.95, Children: $16.95 / Enjoy all your breakfast favorites, omelet stations, waffle stations, seafood stations, carving stations and dessert stations with beautiful vineyard views / Buffet (+ unlimited sparkling). Now serving Bloody Mary’s! / Reservations can be made at www.wilsoncreekwinery.com or call 951.699.9463 for additional information.